The preliminary stage of the 10-day naval war games, entitled Velayat-90, was completed on Monday, and Iranian warships, submarines, and other naval vessels spread out across the theaters of operations, which cover a wide area from the Strait of Hormuz to the Gulf of Aden. The deployment of naval units was carried out as naval vessels, submarines, and helicopters practiced military tactics in preparation for the main stage of the war games, Rear Admiral Mahmoud Mousavi, who is the spokesman of the maneuvers, told IRNA on Monday. He also said that during the preliminary stage of the war games, submarines of the Tareq class successfully fired electrically propelled torpedoes for the first time. The commander of the Iranian Navy, Rear Admiral Habibollah Sayyari, said on December 22 that the war games would be staged in a large area from the east side of the Strait of Hormuz in the Gulf of Oman to the northern Indian Ocean, adding that in terms of intelligence, the maneuvers would cover a vast area stretching from the northern Indian Ocean to the Gulf of Aden. Sayyari also said that the war games would be conducted in the vicinity of Oman, Yemen, Pakistan, India, and northern Somalia and would be conducted in accordance with international regulations. The maneuvers will display the prowess of Iran's armed forces as well as the Navy's defensive and deterrent power and its capability to provide security for vessels sailing on the open seas, he explained. 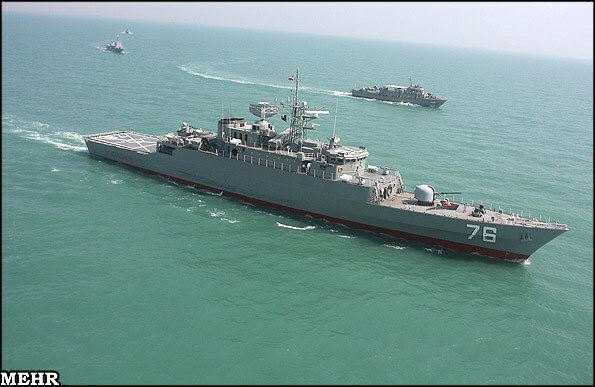 Rear Admiral Mousavi also announced that Iranian naval units warned away a foreign helicopter that had entered one of the theaters of the war games on Sunday. "The previous day, we saw a helicopter of an extra-regional country enter our units' area of operation, and the helicopter was forced to leave the area after receiving repeated warning signals," he said.